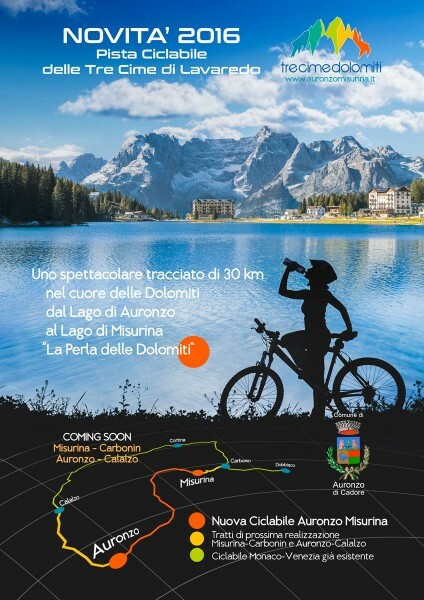 The continuation of the cycle track between Auronzo and Misurina has been newly completed during the last summer. The route connects up the town of Auronzo with the higher part of the area Misurina, ‘the Pearl of the Dolomites’ and is named the ‘Lake Cycle Track’. The section from Auronzo to Palùs San Marco (15 km approx.) is suitable for everyone including children and cycle tourists as there is no significant climbs or descents in either direction. The Palùs San Marco to Misurina section, on the other hand, puts keen cyclists to the test. Uphill there is a challenging climb of around 700 metres, perfect to test your e-bike. The section which passes through the Somadida forest is particularly beautiful. With the TrenoBus you can run the cycle ring between Calalzo, Cortina, Misurina and Auronzo. Auronzo’s cycle and pedestrian track is around 8 km long and runs along the left bank of Lake Santa Caterina before continuing to Giralba and crossing the Ansiei River twice. This pressed earth route passes through the sports field area where S.S. Lazio trains and the Monte Agudo ski area parterre and access to the Fun Bob and Tre Cime Adventure Park is thus straightforward.